Platfora is a system that allows users to gather raw data and turn them into valuable analytics but in a better way than most of its competition. 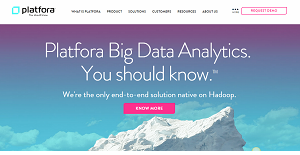 Harnessing the potential Hadoop technology, Platfora can turn raw data into meaningful information faster and cheaper than other business intelligence platforms in the market. Thus means any business using the Platfora solution can start gathering big data to discover, engage, and derive insight from it. Businesses can easily access big data and visualize insights and solutions in a very small timeframe. And since Platfora is built on HTML5, users can easily access the system from anywhere using any mobile and internet-capable device. Handle big volumes of big data and easily derive insights and solutions. Discover enormous amount of raw data that most business intelligence platforms fail to detect. Dish out questions without worrying about having IT and coding knowledge. Faster processing time allows you to extract insights without compromising speed. You get your business data insights in a short amount of time, not weeks or months. If you are considering Platfora it could also be beneficial to investigate other subcategories of Best Business Intelligence Software collected in our base of SaaS software reviews. Companies have unique wants and requirements and no software application can be ideal in such a scenario. It is useless to try to find an ideal off-the-shelf software system that fulfills all your business needs. The wise thing to do would be to customize the solution for your specific requirements, worker skill levels, budget, and other factors. For these reasons, do not rush and invest in well-publicized leading solutions. Though these may be widely used, they may not be the best fit for your unique wants. Do your groundwork, look into each short-listed platform in detail, read a few Platfora reviews, call the seller for explanations, and finally select the application that offers what you need. How Much Does Platfora Cost? We realize that when you make a decision to buy Business Intelligence Software it’s important not only to see how experts evaluate it in their reviews, but also to find out if the real people and companies that buy it are actually satisfied with the product. That’s why we’ve created our behavior-based Customer Satisfaction Algorithm™ that gathers customer reviews, comments and Platfora reviews across a wide range of social media sites. The data is then presented in an easy to digest form showing how many people had positive and negative experience with Platfora. With that information at hand you should be equipped to make an informed buying decision that you won’t regret. What are Platfora pricing details? What integrations are available for Platfora? If you need more information about Platfora or you simply have a question let us know what you need and we’ll forward your request directly to the vendor.